It seems that every week brings a new development in this deepening intercontinental collaboration researching the “Caesarea inscription”—the ancient Hebrew inscription (which is not ancient at all) mentioning Nazareth which scholars routinely consider “proof” that the hometown of Jesus existed in Roman times. This series of posts on Mythicist Papers is now in its third month (the first post to this website regarding this inscription was back on June 10). Mr. Enrico Tuccinardi in Italy, an anonymous colleague in Israel, and myself in the U.S. have assiduously followed up numerous leads with the result that an entirely unsuspected background has come to light regarding the “Caesarea inscription” (in quotes because readers of this blog now know that the inscription never actually existed except in the minds of modern scholars). This post conveys one of the most dramatic revelations that I have personally experienced in many years of researching Israeli archaeology. I believe it can be said that, from this time forward, it will not be possible to confidently view the “Caesarea inscription” as evidence for anything except fraud. From now on, those who consider the archaeology of Nazareth must do so without the benefit of this much touted inscription. A few days ago Mr. Tuccinardi brought the following two shocking letters from 1972 to my attention. Both are in the public domain (despite the superposed ASOR request to contact for permission) and are freely available online HERE (see pp. 16-20). 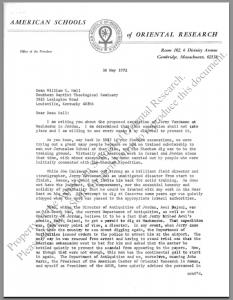 The first letter is from Dr. G. Ernest Wright, past President of The American Schools of Oriental Research (ASOR). It directly concerns the character of the late Dr. E. Jerry Vardaman and is no doubt the most devastating peer critique of a scholar that I have ever read. As regular reader’s of this website know, Dr. Vardaman was the Baptist minister and biblical archaeologist who discovered the Nazareth fragment of the “Caesarea inscription”—a fragment Mr. Tuccinardi and I have already determined was “planted” in the field. We have also determined scientifically that the “Caesarea inscription” never existed (the three fragments cannot be assembled into any single plaque). Details of how these astonishing conclusions were reached can be found in the preceding blog posts. 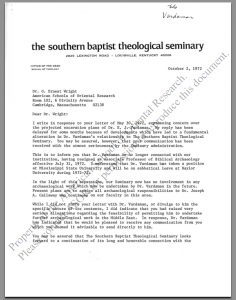 Dr. Wright’s extensive letter (the first, below) more than vindicates long-held suspicions that Prof. Vardaman was dishonest to a degree involving actual criminal behavior. 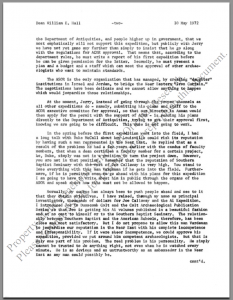 The letter furnishes a laundry list of Dr. Vardaman’s professional shortcomings ranging from gross incompetence to moral turpitude, and even indicates that Vardaman was at one point subject to arrest by the Jordanian police for activity including bribery. 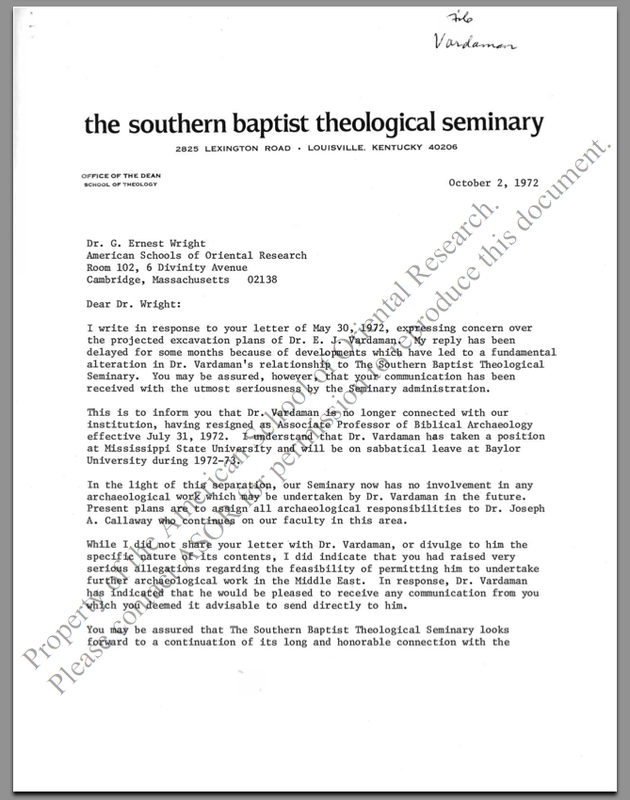 In the strongest terms, Dr. Wright through this letter impresses upon Dr. William Hull (Dean of The School of Theology, Southern Baptist Theological Seminary, under whom Vardaman was working at the time) that Dr. Vardaman “cannot be trusted.” Wright “raised very serious allegations regarding the feasibility of permitting [Vardaman] to undertake further archaeological work in the Middle East” (as stated in Dr. Hull’s reply). Dr. Vardaman was employed by the Southern Baptist Theological Seminary (Louisville, KY) at the time of the 1962 Caesarea excavations. However, he surprisingly abandoned those excavations a week before the season ended and on the very day that the crucial “Nazareth” fragment was discovered. His peremptory disappearance has heretofore been a mystery to me, but the mystery seems to be solved by Dr. Wright’s letter. 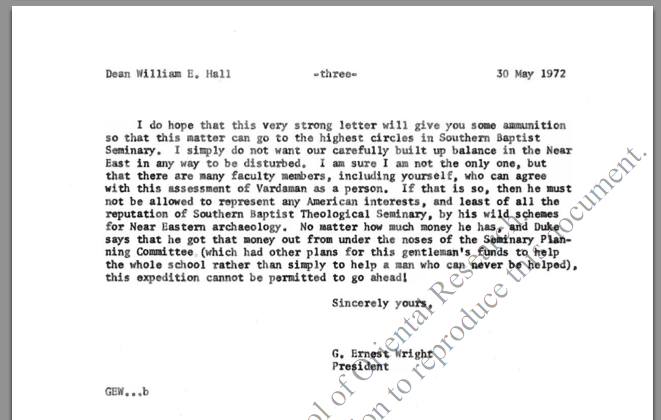 Wright states that Vardaman’s “attempt to dig at Caesarea some years ago [i.e. in 1962] was quietly stopped when the word was passed to the appropriate Israeli authorities” (end of third paragraph). 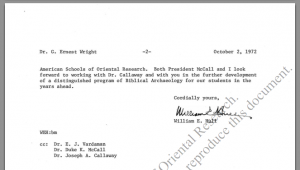 We may wonder what “word” was passed to the Israeli authorities, and why Dr. Vardaman was apparently relieved of his duties directly after the “Nazareth” fragment was discovered (Aug. 14, 1962). These considerations will be taken up in the next post to this website. 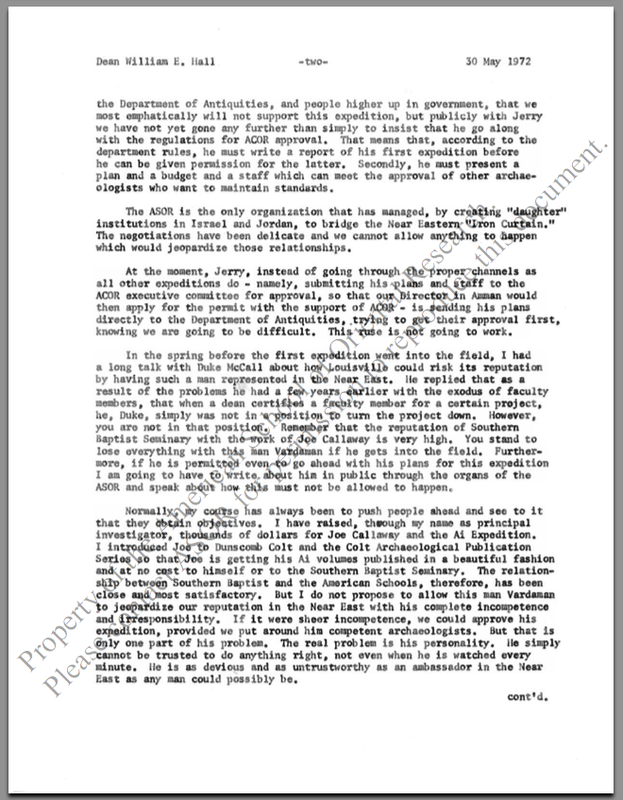 I have retyped the two letters below with a few minor comments in green font, along with copies of the original pages on the right which are quite legible.—R.S. I am writing you about the proposed excavation of Jerry Vardaman at Machaerus in Jordan. I am determined that this excavation shall not take place and I am willing to use every means at my disposal to prevent it. 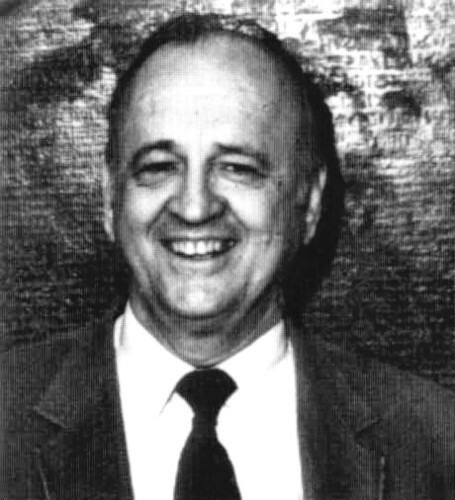 While Joe Callaway came out strong as a brilliant field director and stratigrapher, Jerry Vardaman was an unmitigated disaster from start to finish. Hence, we could not invite him back for solid training. He does not have the judgment, the temperament, nor the essential honesty and solidity of personality that he could be trusted with any work in the Near East on his own. His attempt to dig at Caesarea some years ago was quietly stopped when the word was passed to the appropriate Israeli authorities. the Department of Antiquities, and people higher up in government, that we most emphatically will not support this expedition, but publicly with Jerry we have not yet gone any further than simply to insist that he go along with the regulations for ACOR approval. This means that, according to the department rules, he must write a report of his first expedition before he can be given permission for the latter. Secondly, he must present a plan and a budget and a staff which can meet the approval of other archaeologists who want to maintain standards. The ASOR is the only organization that has managed, by creating “daughter” institutions in Israel and Jordan, to bridge the Near Eastern “Iron Curtain.” The negotiations have been delicate and we cannot allow anything to happen which would jeopardize those relationships. At the moment, Jerry, instead of going through the proper channels as all other expeditions do—namely, submitting his plans and staff to the ACOR executive committee for approval, so that our Director in Amman would then apply for the permit with the support of ACOR—is sending his plans directly to the Department of Antiquities, trying to get their approval first, knowing we are going to be difficult. This ruse is not going to work. In the spring before the first expedition went into the field, I had a long talk with Duke McCall about how Louisville could risk its reputation by having such a man represented in the Near East. He replied that as a result of the problems he had a few years earlier with the exodus of faculty members, that when a dean certifies a faculty member for a certain project, he, Duke, simply was not in a position to turn the project down. However, you are not in that position. Remember that the reputation of Southern Baptist Seminary with the work of Joe Callaway is very high. You stand to lose everything with this man Vardaman if he gets into the field. Furthermore, if he is permitted even to go ahead with his plans for this expedition I am going to have to write about him in public through the organs of the ASOR and speak about how this must not be allowed to happen. Normally, my course has always been to push people ahead and see to it that they obtain objectives. I have raised, through my name as principal investigator, thousands of dollars for Joe Callaway and the Ai Expedition. I introduced Joe to Dunscomb Colt and the Colt Archaeological Publications Series so that Joe is getting his Ai volumes published in a beautiful fashion and at no cost to himself or to the Southern Baptist Seminary. The relationship between Southern Baptist and the American Schools, therefore, has been close and most satisfactory. But I do not propose to allow this man Vardaman to jeopardize our reputation in the Near East with his complete incompetence and irresponsibility. If it were sheer incompetence, we could approve his expedition, provided we put around him competent archaeologists. But that is only one part of his problem. The real problem is his personality. He simply cannot be trusted to do anything right, not even when he is watched every minute. He is as devious and as untrustworthy an ambassador in the Near East as any man could possibly be. I do hope that this very strong letter will give you some ammunition so that this matter can go to the highest circles in Southern Baptist Seminary. I simply do not want our carefully built up balance in the Near East in any way to be disturbed. I am sure I am not the only one, but that there are many faculty members, including yourself, who can agree with this assessment of Vardaman as a person. If that is so, then he must not be allowed to represent any American interests, and least of all the reputation of Southern Baptist Theological Seminary, by his wild schemes for Near Eastern archaeology. No matter how much money he has, and Duke says that he got that money out from under the noses of the Seminary Planning Committee (which had other plans for this gentleman’s funds to help the whole school rather than simply to help a man who can never he helped), this expedition cannot be permitted to go ahead! 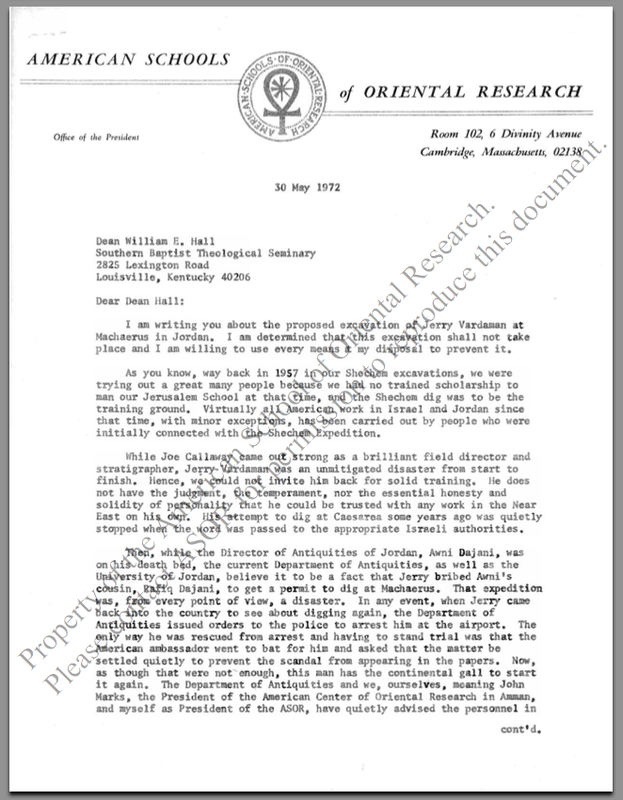 I write in response to your letter of May 30, 1972, expressing concern over the projected excavation plans of Dr. E. J. Vardaman. 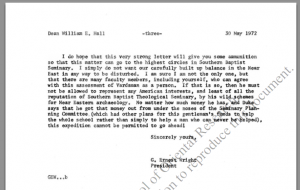 My reply has been delayed for some months because of developments which have led to a fundamental alteration in Dr. Vardaman’s relationship to The Souther Baptist Theological Seminary. You may be assured, however, that your communication has been received with the utmost seriousness by the Seminary administration. 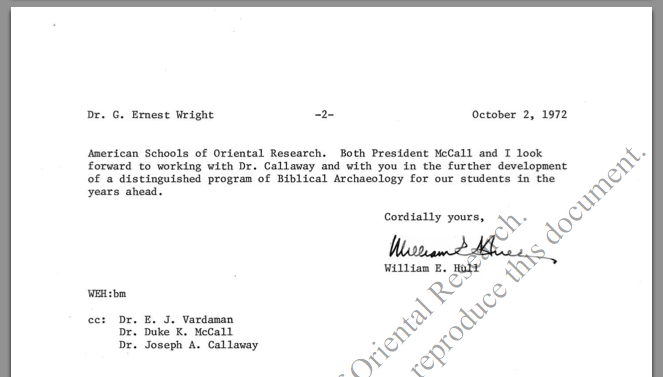 This is to inform you that Dr. Vardaman is no longer connected with our institution, having resigned as Associate Professor of Biblical Archaeology effective July 31, 1972. I understand that Dr. Vardaman has taken a position at Mississippi State University and will be on sabbatical leave at Baylor University during 1972-73. In the light of this separation, our Seminary now has no involvement in any archaeological work which may be undertaken by Dr. Vardaman in the future. Present plans are to assign all archaeological responsibilities to Dr. Joseph A. Callaway who continues on our faculty in this area. While I did not share your letter with Dr. Vardaman, or divulge to him the specific nature of its contents, I did indicate that you had raised very serious allegations regarding the feasibility of permitting him to undertake further archaeological work in the Middle East. In response, Dr. Vardaman has indicated that he would be pleased to receive any communication from you which you deemed it advisable to send directly to him. American Schools of Oriental Research. Both President McCall and I look forward to working with Dr. Callaway and with you in the further development of a distinguished program of Biblical Archaeology for our students in the years ahead.